If you are a backyard chef in the city, the Weber Q 2400 electric grill is the answer to your grilling dreams. Its larger capacity, powerful performance capabilities and Weber quality standards make it a perfect addition to any outdoor cooking collection. Some assembly required. Designed for indirect cooking on Webers 22-inch and 26-inch charcoal grills with Char-Basket charcoal fuel holders. These disposable aluminum pans are also great for serving side dishes and dessert. Each pan measures 8.5-inch W x 16.5-inch L x 1.75-inch H. Five pans per pack. Offering understated elegance to your home's exterior, the Weber Original 22-inch Kettle in black charcoal features a classic profile design. A great way to accomplish many outdoor cooking tasks, this BBQ helps deliver long-lasting performance thanks to its porcelain-enameled lid and bowl, aluminized steel cleaning system and rust-resistant aluminum legs. A 363 sq.-inch cooking surface gives you plenty of space to cook up your favorite, mouth-watering meals. Q 2400 Outdoor Electric BBQ If you are a backyard chef in the city, the Weber Q 2400 electric grill is the answer to your grilling dreams. Its larger capacity, powerful performance capabilities and Weber quality standards make it a perfect addition to any outdoor cooking collection. Some assembly required. 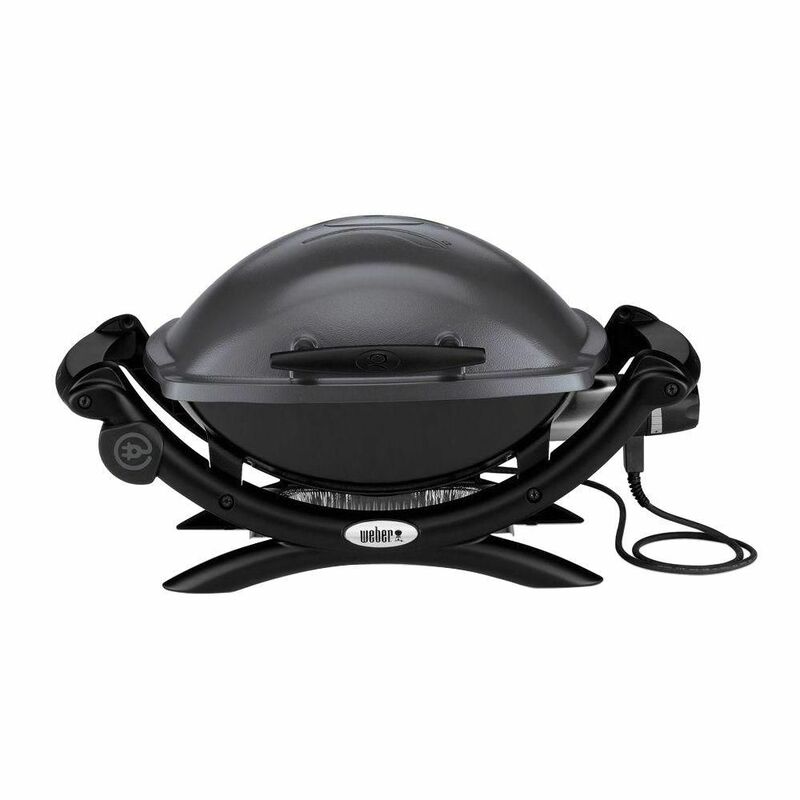 Q 2400 Outdoor Electric BBQ is rated 4.7 out of 5 by 286. Rated 5 out of 5 by Wjwdew from Great bbq A great BBQ for our patio. No need for tanks anymore. Rated 5 out of 5 by Vic3k from A culinary must have ! This is our first electric grill. We moved to a condo and this grill is perfect on our balcony. Weber makes an amazing product and this grill is no exception. Meats cook perfectly without flair ups. You wouldn’t be disappointed ! Rated 3 out of 5 by Condogriller from Condo useful I bought the electric Weber grill to comply with my condo rules. It certainly isn’t a propane grill but does do an adequate job grilling steaks, burgers etc. I find that the clean up is a chore.. not as easy as the salesman said. All in all I like having a barbecue again. Rated 5 out of 5 by Romar from Love the even heat! We had been looking for a more safe alternative for our apartment balcony than a propane bbq, and something that would be available to use year round. The Weber Q2400 fits the bill! Rated 5 out of 5 by Whitefish from A great BBQ I switched from a gas bbq to electric. Less mess and no more running out of propane. The Weber Q2400 is a quality product and I am glad we switched. Rated 5 out of 5 by Horndog from This BBQ is the best thing since sliced bread. Beats my gas BBQ by a mile. It would be nice if they had dual elements. Also the catch tray under the elements should be replaceable as it gets pretty messy when you use it a lot. Over all this is the best BBQ I have owned. Rated 4 out of 5 by SarahQ from Great Performance!! My only problem with this BBQ is the lack of accessories for the electric BBQ ie: Rotisserie, warming shelf. I've had this grill for a year now and even though I couldn't use it over the winter, last summers use gave me a good idea about its great performance. My switch from 15 yrs of propane to electric was almost seemless ( miss my rotisserie).Perfect for use on a balcony. Hello Helen, the Q 2400 requires 1,560 watts/120 volts. Thanks! I am looking at purchasing a portable Weber BBQ. How much power do the electric ones use? Can it be used along with the camper/air conditioner in a 50 amp site?